"Delicious with coffee or tea. 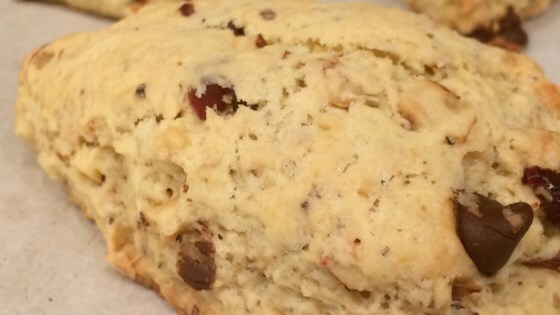 Instead of pancakes or waffles for breakfast, serve these scones warm with or without butter and maple syrup (very sweet)." Set oven rack to lower center of oven. Preheat oven to 375 degrees F (190 degrees C). Toast walnuts on a baking sheet in the preheated oven for 3 to 5 minutes. Cool. Whisk together the flour, sugar, baking powder, and salt in a large bowl. Toss butter pieces in the flour mixture to coat. Use a pastry blender to cut in the butter until the mixture resembles fine crumbs. Stir in toasted walnuts. Beat egg in a large bowl. Mix in the half-and-half, 1 teaspoon maple extract, and vanilla extract. Stir the dry ingredients into the wet ingredients, mixing just until blended, switching from a spoon to your hands as the mixture comes together. Place dough in refrigerator for 10 minutes. Roll chilled dough into a ball on a lightly floured surface. Flatten dough into a 3/4 inch circle. Cut into 8 wedges. Bake scones on a parchment lined baking sheet just until firm and the bottoms are lightly browned, 15 to 20 minutes. Cool for 3 minutes before transferring to cooling racks. Stir together the confectioners' sugar, hot water, and 1/8 teaspoon maple extract. Drizzle on scones to glaze. MY SCONES CAME OUT DRY AND CRUMBLY. IT MAY BE BECAUSE MY BAKING POWDER WAS OLD. I WILL TRY AGAIN WITH FRESH BAKING POWDER. These sound delish! Love Maple and Walnut and Scones. Can't wait to try.